Offering more than a website redesign, DDA revamps the United Support Solutions’ brand identity. In order to take their marketing to the next level, the Director of Business Development at United Support Solutions, Inc. knew that a website redesign was in order. After designing a folder brochure for United Support Solutions with a new, more sophisticated brand identity, DDA was a logical and ideal choice for the website redesign project. The challenge was to analyze competitor websites and design one for United Support Solutions that is completely unique and goes above and beyond standard development, so that customers and clients would see United Support Solutions as the industry leader it is. 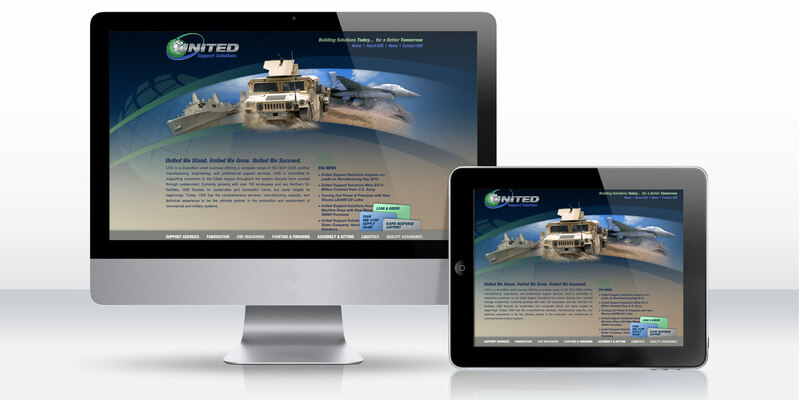 Although United Support Solutions has gained a strong foothold in the military arena, the company wanted the website to visually represent the diverse range of market segments it serves. At onset, users were to understand the full breath of services the company has to offer and the intricate equipment it produces. United Support Solutions wanted to highlight three main attributes—lean/green manufacturing, one-stop supply chain, and rapid response support—that further distinguishes the company from the competition. Yet another key objective of the website redesign project was to incorporate a careers section complete with information on current job openings. After creating a new brand identity in the recently completed brochure designed and produced by DDA, DDA continued that corporate identity by designing the website with a consistent look and feel. Instead of developing a rudimentary image slideshow, DDA designed seven different image collages—each incorporating a background image representative of a market segment and related product shots. This was done to showcase the company’s manufactured products in a “big picture” environment. The website was designed by DDA to provide a unique menu system that stretches horizontally along the bottom of the website, sticking to the bottom of the browser window regardless of a computer’s screen size or resolution. The three main attributes United Support Solutions wanted to emphasize were made into three featured elements in the main navigation of the site, so they couldn’t be missed. DDA effectively transformed the company’s old template website into a completely custom redesign. More than pleased with the new website, United Support Solutions has stated, “The outcome is amazing.” United Support Solutions is proud to announce this new website as a completely redesigned resource for all stakeholders. Visitors to the new site see the true breadth of one-stop manufacturing and support services that United Support Solutions offers.